Howard J. Ross is founder and chief learning officer of Cook Ross Inc., a diversity consulting company. He is one of the nation's leading diversity consultants and a nationally recognized expert on diversity, leadership, and organizational change. Founder of a diversity consulting company, Ross examines how to identify and overcome unconscious biases in everyday life. He takes up much more than discrimination based on race, gender, national origin, and other protected categories. The author delves into perceptions of Democrats and Republicans toward presidential candidates, patient income with respect to health care, shapes of objects relative to the shapes of objects around them, the George Zimmerman/Trayvon Martin criminal case, and homosexuality. Ross lists a wide variety of biases—such as the tendency to anchor on one trait to make decisions and the inclination to make conclusions about a person based on first impressions—and draws on numerous research studies to support his conclusions. He also points to ways to overcome both personal and organizational bias. The former includes accepting uncertainty in life, exploring awkwardness and uncomfortable feelings, and getting feedback from others; the latter, finding patterns of privilege or exclusion of employees, brainstorming, listening to dissenting opinions, and analyzing the quality of information obtained. . . .Summing Up: Recommended. Upper-division undergraduates through faculty; professionals; general readers. The author explores the many biases that we each carry within us. Most people do not see themselves as biased towards people of different races or different genders. And yet, in virtually every area of modern life, disparities remain. Breakthroughs in the cognitive and neurosciences give some idea why our results seem inconsistent with our intentions. Bias is natural to the human mind, a survival mechanism that is fundamental to our identity. And, overwhelmingly, it is unconscious. Incorporating anecdotes from today’s headlines alongside case studies from over 30 years as a nationally prominent diversity consultant, Ross helps readers understand how unconscious bias impacts our day-to-day lives and particularly our daily work lives. He also provides examples of behaviors that the reader can engage in to disengage the impact of their own biases. Howard Ross, a diversity expert, consultant, and founder of Cook-Ross, Inc., writes an in-depth look into the human mind and explores the known and unknown biases that constantly shape our thoughts and actions. . . .I believe this text would be helpful for business students and those who are currently in the workforce. . . .[This book] could be a valuable addition for those interested in the topic of bias and how it is manifested. getAbstract recommends Ross's insights to human resource professionals, managers and leaders dealing with a diverse workforce, and to anyone seeking to learn, grow and evolve. We are certain we are 'one' person, not a thousand different selves reacting unconsciously to thousands of different stimuli. Everyday Bias is an important guide to seeing oneself the way others might. Howard Ross has done it again! Another gem that promises and delivers validated and practical methods for understanding our own biases. 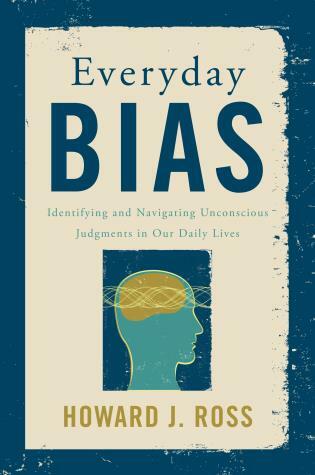 Everyday Bias explores those areas of bias that we all have and how it has meaningful, often negative impact for businesses, schools and society in general. For the casual interested reader or the chief diversity officer of an organization this book stands out as an invaluable guide to recognizing one’s own biases and how to effectively interrupt our usual patterns of thinking and behavior. Moreover, it offers fresh thinking through vivid examples of promising practices to disrupt unconscious bias by organizations and corporations. Howard is the unique writer that can blend evidence based data, rigorous analytical research and invaluable personal knowledge to ensure every reader finds a new and important insight. — Marc A. Nivet, Chief Diversity Officer, Association of American Medical Colleges, Inc. The real genius of Everyday Bias is that it allows all of us to better understand bias without the guilt that often prevents us from addressing it. . . . Howard’s P.A.U.S.E. model is a groundbreaking shift in how to reconcile bias in an empowering way that will create stronger organizations and nations, better equipped to leverage the strength of difference. Howard Ross has thoroughly researched and clearly explained how and why we human beings engage in unconscious judgments. Most importantly, he helps us see how we can find a way not to act on our unconscious biases about people who are different from us. I learned an enormous amount from this book. Read it and you will too! Written by a consummate professional in diversity and inclusion consultancy, this book reinforces my belief that we human beings have the capacity to discover a new and effective way to acknowledge our differences and to move toward a day when our differences do not make any more difference. For decades leaders have been challenged with how to effectively build and tap in to the full power of diversity and inclusion. By learning to accept the human tendency towards “bias,” Howard Ross provides a solution for the reader to more effectively design and lead his or her organization towards greater human engagement and powerful organizational results. Leaders of all types will benefit from these questions, methods and techniques to foster engaged, innovative and powerfully productive teams.